The Practice Nurse (Diane Blackham) and Assistant Practitioner (Julie Roberts) are available by appointment. They are able to offer a wide range of services but are particularly concerned with preventing disease and promoting good health. 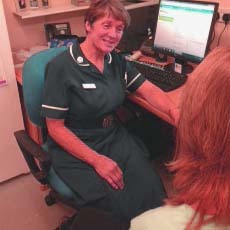 The Practice Nurse and Assistant Practitioner also play an important part in monitoring and providing information for those with diabetes, asthma, high blood pressure and coronary heart disease. They offer health checks including those for newly registered patients.